Top Notch Quality – Invest in the Best Mini Road Pump for Lasting High Performance. Don’t make the mistake of buying a cheap pump and getting stranded far from home! The perfect road bike pump at only 7.3 inches and 3.49 oz. We know (small) size does matter! The perfect mini road pump with max pressure of 120 psi. Brilliant flexible hose design delivers easy pumping and no damaged or broken valves – unlike ‘push or clamp-on’ style mini bike pumps! We know our products are the Best Quality and they’ll last a lifetime, that’s why we provide a Lifetime Guarantee, so you can shop with Confidence! Click The “Add To Cart Button” NOW, before the Amazing Sale price comes to an end!GET BACK RIDING FAST – Reach riding pressure with 30% fewer pumping strokes than conventional mini bike pumps. High pressure up to 120 psi/8.3 bar. 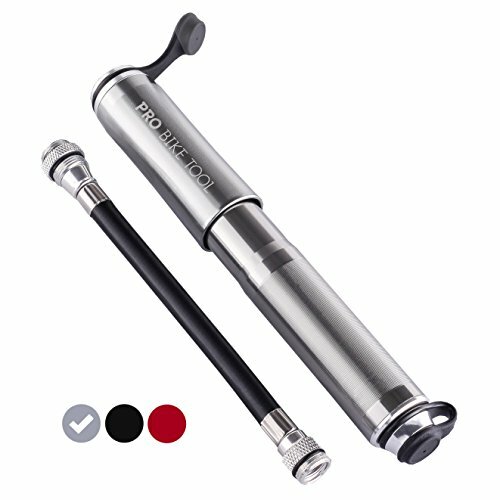 SUPER COMPACT & LIGHTWEIGHT portable bike pump – Only 7.3 inches long & 3.49oz, perfect for ‘size & weight’ obsessed cyclists! RELIABLE & BUILT TO LAST – Dependable pumping ‘time after time’, when you need it the most. NO PUMP RATTLES OR LOST PUMP with our safe & secure frame mount bracket with velcro strap. LIFETIME GUARANTEE, RISK FREE – We’re so confident about the quality of our products that we provide an Amazing Lifetime Guarantee, allowing you to BUY WITH CONFIDENCE for WORRY FREE shopping!